Lowdown: Flint has to stop his food machine again, this time from creating a Jurassic Park. Sequels: you gotta hate them. That is, unless they’re called The Empire Strikes Back, Temple of Doom or Terminator 2. Seriously, though, what chance does the Cloudy with a Chance of Meatballs franchise have at belonging to that club? Hardly any, unless – of course – it tries to go after another ultra successful franchise. Jurassic Park. 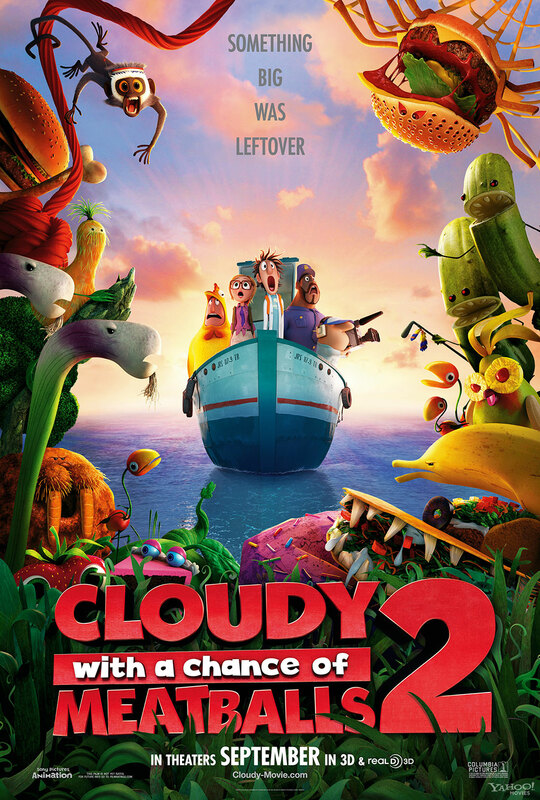 Enter Cloudy with a Chance of Meatballs 2, a sequel of a somewhat misleading name: it will only present you with mutated meatballs. Our heroes, the computer animated inventor Flint & Co, return almost in one piece (there is the notable exception of Mr T, whose cop character has been replaced by an infinitely inferior voice actor). They are relocated from their island, and in the meantime Flint finds himself a job at Live – a company directed by his scientist of a lifetime inspiration, Chester. Chester looks an awful like Phil Plait, and clearly he is the villain of this one (which is why I said "awful", because I adore Phil Plait). You know that because his San Francisco company takes its employees to work on special buses that otherwise interrupt the local population (an interesting jab, coming from filmmaker Sony, towards a certain company called Google). In another interesting jab at Google, at least as presented in The Internship, our Flint loses his chance at winning a coveted employee position through an invention accident. Flint is deemed useless, but Chester does find something he can use him for: help him subdue Flint’s former food machine, which is now surrounded by a jungle full of weird monsters such as spider-burgers and shrimp-panzees. Flint sees an opportunity to work by the side of his inspiration and takes it, which gives us viewers plenty of opportunities to witness Cloudy with a Chance of Meatballs versions of famous Jurassic Park scenes; only that instead of the latter’s dinosaurs, we have the former’s food inspired mutations. And yes, eventually we will get to realise who the real monster in this movie is. Obviously, Cloudy with a Chance of Meatballs 2 is a classic sequel in the sense that it tries to sell us the same thing again so that our kids will force us to take them to the cinemas and open our wallets wide. Very wide. Yet, it does deliver, mostly through inventive/creative combinations of food monsters. I particularly liked the fish loving cucumbers. Can someone get me a cuddly cucumber toy? Overall: One can do much worse for their kids during school holidays. Then again, one should be able to do better. 2.5 out of 5 crab-sauruses; not bad, but nothing too special.